- click Tools -> Internet Options menu command; then click "Advanced" tab. 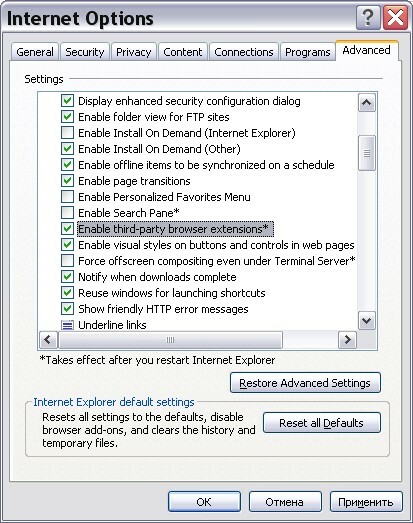 In the list of policies, under "Browsing" category, find and enable (check) "Enable third-party browser extensions" item. Restart the browser. changes will be applied after restart of Internet browser on user computers. In the teacher console select client computers; click the main menu command N - Options - Remote Computer Options. On Components tab uncheck "Control websites from service (IE only)" option and click OK.
4. All current browsers assume that any user can disable plugins at any moment. If Internet restrictions should be applied to other browsers (not Internet Explorer and Firefox), which are not based on Internet Explorer engine: Opera, Google Chrome, Safari etc., you need to enable Protocol Layer Mode for Net Control 2's Internet Control Engine as described in the article: Internet restrictions do not work in Opera, Google Chrome, Safari etc., but please try this mode first on 1-2 computers with a restore point created before applying the settings. This mode may interfere with other software that uses the same technique (old versions of Panda and ESET NOD32 antiviruses).